The following is an excerpt from President MacLatchy's keynote address at the Laurier-International Women's Forum luncheon Advancing Women in STEAM in honour of International Womens' Day. 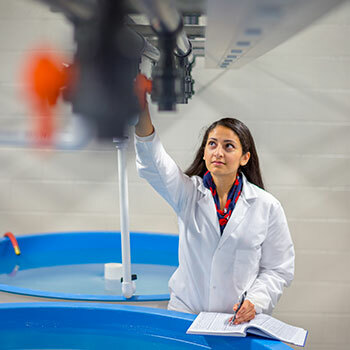 As a scientist, and having seen firsthand both the barriers and opportunities women have in this field, I am pleased that on International Women’s Day Laurier and the International Women’s Forum are hosting a luncheon and panel discussion to explore how we can advance women in STEAM (science, technology, engineering, arts and mathematics) and encourage young girls to pursue exciting career paths in these disciplines. Did you know that the majority of children who are asked to draw a scientist draw a man? The draw-a-scientist test is a fascinating piece of social science that has been studied for many decades. In the first study, published in 1983, of the almost 5,000 drawings produced, just 28 children drew a female scientist. That’s just one half a per cent of children who drew a woman. The good news is that from the 1980s onward, when we look at data from 77 similar studies, about 28% of children drew female scientists. This is a sign that gender stereotypes are slowly changing as more women enter STEM fields. I believe this simple drawing test gives us some valuable insight into why the STEM gender gap persists. In many other fields, women have achieved equal representation. In fact, today, in Canada, women represent 60% of all university graduates. When we parse that out by discipline, however, it’s apparent that certain fields lag behind. In mathematics and computer science programs, only 30% of graduates are women. In engineering programs, women only account for 22% of graduates. While we have good data on representation in these disciplines, we are still trying to understand why women do not pursue these fields, or, if they do, why they tend to exit them at higher rates than men. When I think about this gap, I return to the draw-a-scientist test. If young girls do not see themselves as represented in these roles, it becomes difficult for them to imagine and dream of working in them. This early daydreaming and pretend play of being a doctor, or an astronaut, or an inventor, sparks the initial interest in these disciplines. If we are to address the gender gap. We need to begin in those earliest years. In 2017, Microsoft commissioned research to better understand how we can get girls engaged in science, technology, engineering and math from a young age. The research found that in middle school, 31% of girls believe that jobs requiring coding and programming are ‘not for them.’ By the time these girls reach university age, 58% count themselves out of such careers. However, the research also found that this decline in interest can be mitigated if the girls are introduced to female role models. In fact, 61% of girls feel empowered when they engage in STEM activities if they have a female role model in the field. As a young girl, I did not have many female role models in science. However, in my family, education was highly valued. My mother was a teacher and my father was a physics professor. When I showed aptitude and interest in science, my dad fully encouraged and supported it. One of my most treasured books was a large format The Human Body that my dad gave me in elementary school. I spent hours pouring over the pictures of the circulatory and other systems, mesmerized by the descriptions. It is probably no wonder that I became a physiologist. Research indicates that it is critically important for parents – particularly fathers – to encourage their daughters’ interest in STEM because of the persistent stereotype of STEM fields being male-dominated. Having a parent say ‘I believe in you’ – as my dad did – can be the deciding factor for a girl choosing to pursue computer, technology and engineering classes in high school. In university and college, mentorship continues to be critical to reducing the attrition rate for women in these fields. Laurier also offers mentorship for our students and faculty through the Centre for Women in Science. Today, you will have seen some of the photography work of Dr. Eden Hennessey, who is the centre’s research and programs director. The centre provides programming from casual peer meetups, to organized events and offers scholarships to students who are travelling to conferences to present their research work. For today’s event, the centre has prepared cards that are at each table, which give some tips for mentoring success for both the mentor and mentee. They outline ways that you can make your own contribution to supporting women and other traditionally under-represented groups in higher education and STEM. Equally important is the work that the centre does to bridge the gap between social science and STEM. While we know that women do not have equal representation in these fields, there is a lack of research that helps us understand ‘why.’ By approaching the issue from an interdisciplinary perspective, the Centre for Women in Science supports research that helps develop policies to close the gap. Already our centre has provided support in this area to the federal government and UNESCO. It is my hope that as the body of knowledge in this area grows, we will be able to develop overarching strategies that address the gap and reduce attrition rates of women in these fields. At Laurier, we are addressing the gender gap in the tech industry as well. We just announced the fourth cohort of our Lazaridis Institute’s ScaleUp program – the Women Founders Cohort. This program takes ten of Canada’s most promising tech startups and provides them expertise and mentorship to scale their companies to global competitiveness. These programs are excellent examples of the way that the critical thinking and communication skills in the arts intersect with the traditional STEM disciplines. As our society becomes more complex, the ‘A’ in STEAM becomes more important. One of my life-long interests has been in the study of history. I have a minor in history, which honed my writing skills as well as my ability to think critically and contextually. Those skills have made me a better biologist. And my love of historical novels gives me the opportunity to take mental breaks that revitalize me for the complex science and leadership roles that I occupy in the day-to-day. As we navigate a future where we face complex challenges and questions of climate change, artificial intelligence and big data, we will need STEM professional with a grounding in the arts – people who can parse ethical dilemmas, have inter-cultural knowledge, and who have an ability to make links between seemingly disparate disciplines. Achieving equity in STEM is in the best interest of society. After all, if half of our population is not properly represented in the STEM fields, we will be missing out on valuable insights and perspectives – perhaps even the next great discovery. The under-representation of women in STEM is a complex issue that will not be solved overnight. It requires collaboration among disciplines, data-based policy implementation, and conscious mentorship efforts. While we work together toward solutions, let us not forget to celebrate the milestones. Four years ago, the United Nations declared Feb. 11 as the International Day of Women and Girls in Science. This day has inspired global dialogue about the under-representation of women in STEM. Last year, all of Waterloo – and indeed Canada – celebrated Dr. Donna Strickland’s historic Nobel Prize in Physics. Our Governor General, Julie Payette, is an engineer and astronaut. In 1999, she became the first Canadian woman to work aboard the International Space Station, following in the footsteps of astronaut Roberta Bondar, the first Canadian woman to go to space. Roberta now leads a foundation that focuses on protection of the earth’s wild spaces – springing from her experience of viewing the world from the perspective of space. The Federal Minister of Science and Sport is Dr. Kirsty Duncan, a university professor who teaches medical geography and global environmental processes. This year, Dr. Duncan is working to bring Athena SWAN to Canada. This is a pilot project from the U.K. that promotes equity and inclusion in research. Last year, Merrilee Fullerton, who is a family physician, was named Ontario's Minister of Colleges, Training and Universities. When I met with her recently at another International Women's Day event, she spoke specifically about the importance of mentors who were important to her career journeys in medicine and politics. We all have a role to play in addressing the gender gap in STEM. Sometimes that role is just listening to the experiences of others and engaging in dialogue so we can better understand the issues. On International Women’s Day, we plan to do just that. Our luncheon panel discussion will focus on the experiences, successes and struggles of women in STEAM. It is my hope that on March 8 – and every day – we can be inspired by the stories of those who have pushed for progress and reached behind them to pull up those following behind.